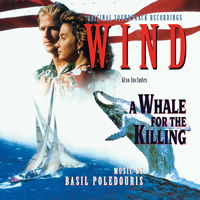 BUYSOUNDTRAX Records presents A WHALE FOR THE KILLING, featuring music composed by Basil Poledouris for the 1981 television movie directed by Richard T. Heffron, based on the book written by Farley Mowat, starring and co-produced by Peter Strauss, along with Dee Wallace, Kathryn Walker, Bruce McGill and Richard Widmark. Also included is the composer’s score for WIND, the 1992 drama directed by Carroll Ballard, written by Rudy Wurlitzer and Mac Gudgeon, starring Matthew Modine, Jennifer Grey, Cliff Robertson, Jack Thompson and Stellan Skarsgård. BUYSOUNDTRAX Records presents A WHALE FOR THE KILLING for the first time on compact disc from the composer’s own elements. At the time of the project, the composer had prepared a release for demonstration purposes and a possible album release. These elements have been remastered by James Nelson of Digital Outland. Previously released twice on compact disc and considered a rarity, WIND has been newly mastered and the original album sequencing has been restored, minus the song contained on the original soundtrack release. Both films appealed to the composer’s love of the sea and sailing and this is reflected in the music he composed for these projects.